Finding a mattress in Wisconsin does not have to leave you tossing and turning at night. Today, the mattress industry is huge, and so are the deals. We know that purchasing a mattress is important and can be daunting, and so we took a look through some of the highest ranked mattresses and mattress stores in the state and divided our mattress coverage by region. We wanted to know which mattress stores offered great selections as well as great customer service and prices. We even went a step further and examined their delivery standards as well as their return policies to ensure that you are able to find the best mattress stores near you. If you are looking for a mattress in Wisconsin, you have certainly come to the right place! If you need to find a mattress store in Milwaukee, we have a few recommendations. Mattress Savings (735 S. 108th St.) provides a good variety of quality mattresses and a patient and knowledgeable sales team. This is a great place to shop if you need some time to consider a mattress on your own or if you are looking for a more curated experience. Speak to the sales team and they may be able to secure you same-day delivery. Bunks and Beds (6121 W. Layton Ave.) supplies a wide-range of mattresses for most styles of beds. You can even find a futon mattress- great! Their customer service team is friendly and honest, and won’t pressure you to overspend. If you are in need of a mattress no matter what the size, you could try Bunks and Beds. When looking for a mattress near Milwaukee, you could check out the Mattress Firm in Glendale. (400 We. Silver Spring Dr.). Mattress Firm always offers a 120 day guarantee- giving you options with such a large purchase. The sales team are knowledgeable and friendly. If you plan your trip around a major holiday you may find a steep discount! Verlo Mattress Factory (66501 W. Layton Ave) is another great mattress shop near Milwaukee. You will find custom builds, eco-friendly, free delivery, and a knowledgeable and helpful staff. 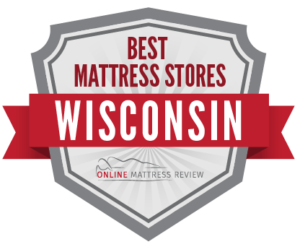 When shopping around for a mattress in Madison we recommend heading to Wisconsin Bedding (5117 Monona Dr. ) who have served the Madison and Dade community since 1929. Here you’ll find a bed for every member of the family. If you are looking for specialized mattresses, or industry standards, definitely take a look in Wisconsin Bedding. Mattress Firm Clearance (2101 W. Beltline Hwy.) out-of-season mattresses for a discount. If you are looking to purchase an affordable mattress, try this location. The sales team will help you find a mattress to fit your budget and work with you on the delivery date. If you live in West Madison try Black Red White Furniture (6798 Watts Rd.). This is where you head if you are looking for a one-stop shop for your mattress and other furnishing needs. The prices are low, and the staff are courteous and knowledgeable. When it comes to delivery and set up, Black Red White Furniture delivers, assembles, and installs. What a relief! If you are looking for a mattress in Green Bay, you’re in luck! There are a number of quality mattress shops in or near Green Bay. Mattress Firm Green Bay offers over 50 brands of mattresses at competitive prices. You will always receive 120 day window to test your mattress which is essential when making such a large purchase. This is the largest mattress retailer in the United States so the phenomenal customer service team makes this particular location stand out. Do you need an affordable mattress? Try Ambrosius Beds (991 N. Military Ave) where you will find factory made beds for up to 80% off the retail price. If you are looking to save, just head here and check our their selection. Verlo Mattress Factory (920 Lambeau St.) makes their own products and will sell well-known name brands. If you are looking for a no-hassle purchase and a sales team that listens to your needs, definitely try Verlo Mattress Factory. Another lesser-known discount mattress shop is Green Bay Furniture Outlet (W. 746 Country Rd Seymour, WI) where you will find a very friendly sales team and a great selection. Chances are after you shop here, you won’t go anywhere else for your mattress for furniture needs. No need to head across the state to find a mattress. You can readily find a mattress near Eau Claire. Happy Sleeper (2600 London Rd.) is a great place to make yourself at home while shopping for a mattress. The sales team are very welcoming and knowledgeable and will never pressure you to purchase. Whatever your style of bed or mattress, Happy Sleeper will help you find something to fit your home. P M Sleep Center has served Eau Claire since the early 80s. The owners and sales team are extremely knowledgeable about every aspect of the mattress business including mattress making. Not only that, but P M Sleep Center has a wide selection of mattresses from which to choose and will help you find something to fit your sleep habits as well as your budget. If you are looking to find a home away from home, head to P M Sleep Center.